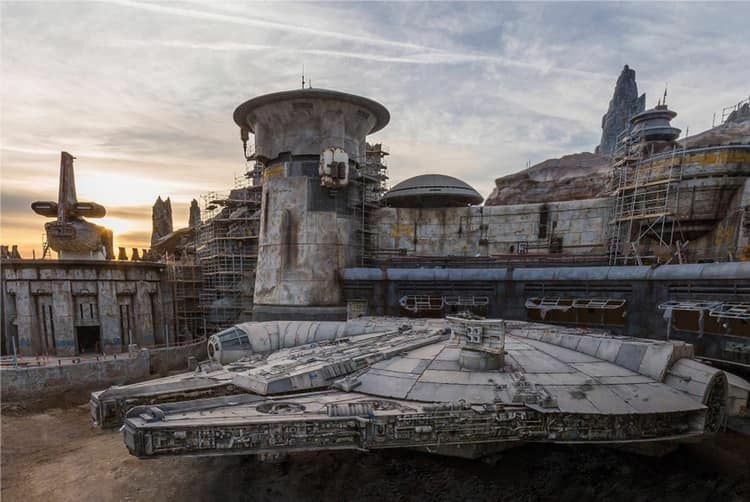 Disney Parks provide a first close-up look at Star Wars Galaxy’s Edge Millennium Falcon. Behind-the-scenes look at development on Star Wars: Galaxy’s Edge! 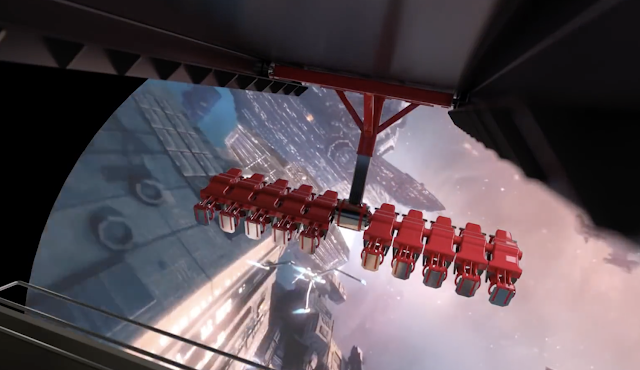 Guests can take the controls of the fastest ship of the galaxy in Millennium Falcon: Smugglers Run, one of two signature attractions coming to this all-new land at Disneyland (summer 2019) and Walt Disney World (fall 2019). 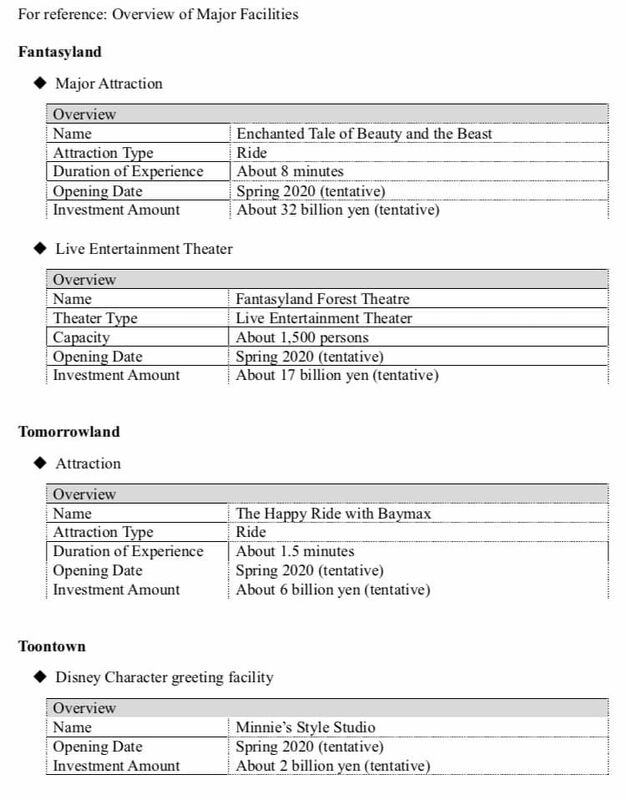 New Press Release about Tokyo Disneyland Development ! 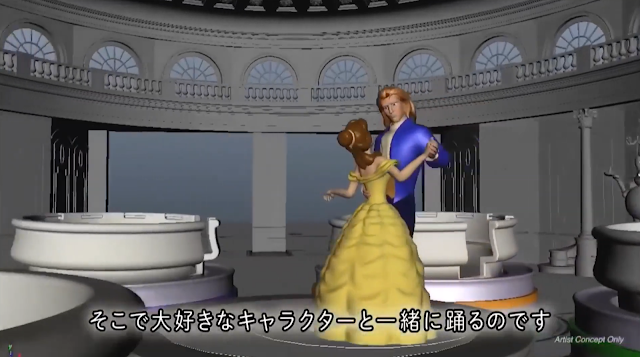 New Press Release about Tokyo Disneyland Development! 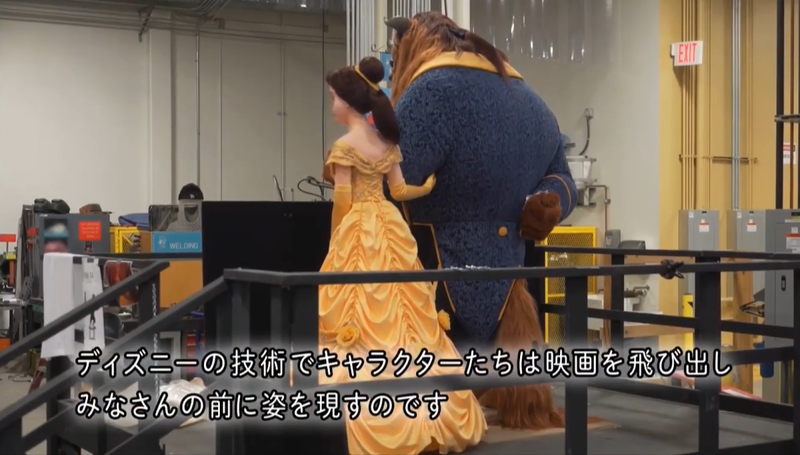 New Facilities Opening in Spring of Fiscal Year 2020 URAYASU, CHIBA— Oriental Land Co., Ltd. has announced the names of the new facilities that will be opening in spring of fiscal year 2020* as part of the large-scale development of Tokyo Disneyland® Park. The new facilities include a major attraction, an all-weather live entertainment theater, a restaurant and shops. This expansion will occupy an area of about 47,000 m2 overlapping Fantasyland, Tomorrowland and Toontown—three of the seven themed lands in the Park. The total investment for this expansion is about 75 billion Japanese yen. 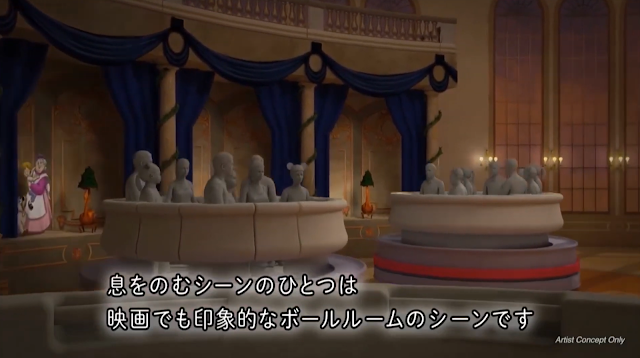 In Toontown, Minnie’s Style Studio will be the first Disney Character greeting facility in Tokyo Disneyland where Guests can meet Minnie Mouse in person. Dressed in some of her own creations, “fashion designer” Minnie will greet and take pictures with Guests. 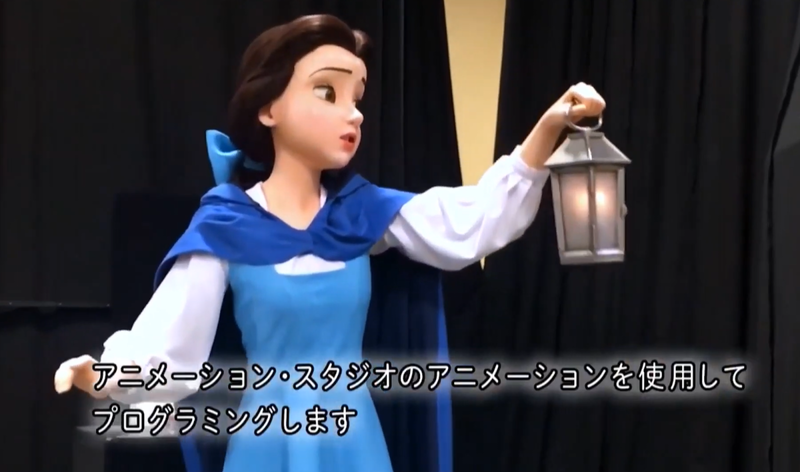 The largest redevelopment in the history of Tokyo Disneyland promises to enchant Guests even more with lots of brand new experiences in the Park. 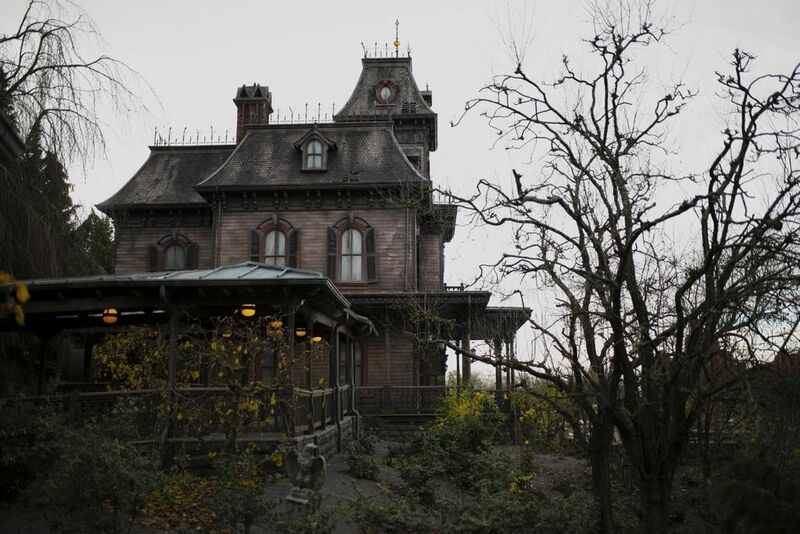 First Official Pictures of Disneyland Paris Phantom Manor ! 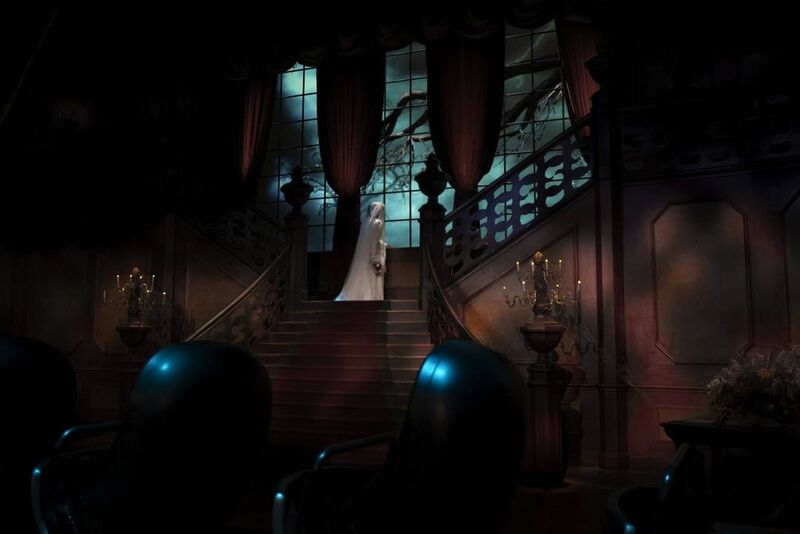 Disneyland Paris released the first official pictures of the renovated Phantom Manor showing the bride in the loading room scene and the Manor gardens! 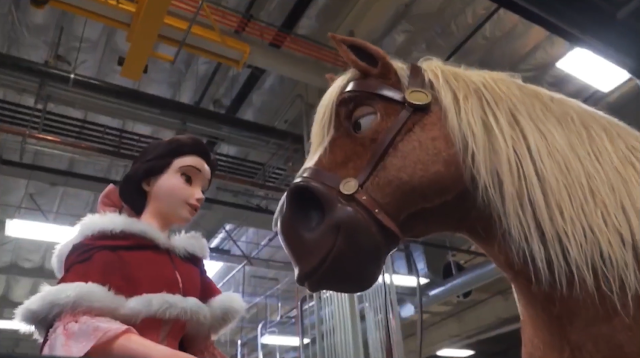 I remind you that the changes in the ride have been done to clarify the ride storyline and to create an end to the story, as the previous version was not perfectly understandable. 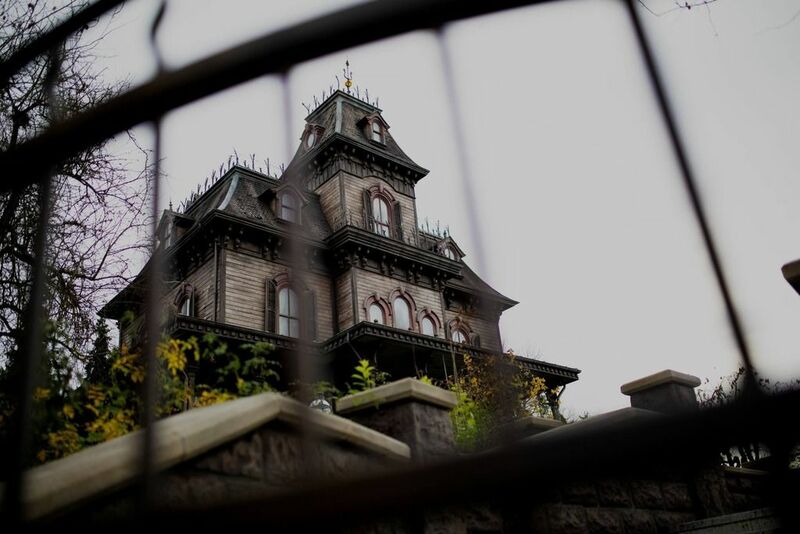 The ride is now rumored to don't reopen before April 2019 though it might happen before if DLP Imagineers succeed to resolve some technical issues. First Trailer for Marvel Avengers 4 "End Game" ! 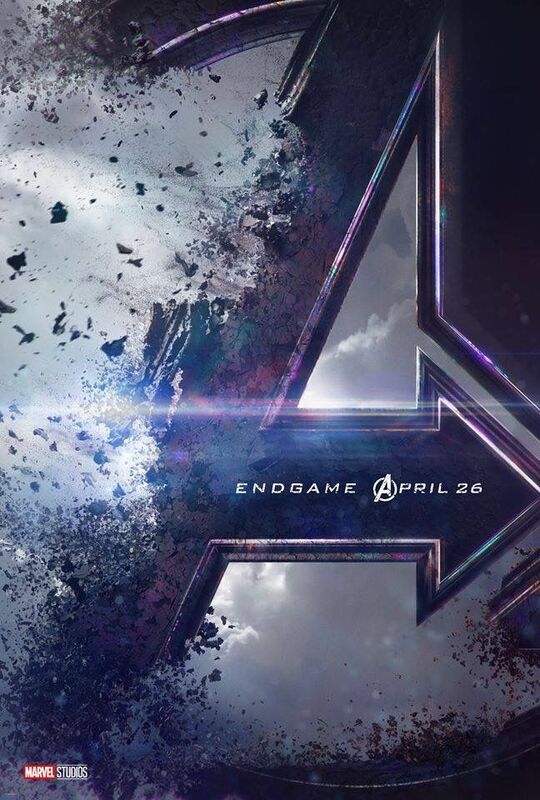 Marvel Studios has released the first trailer for Avengers 4 which is titled "End Game" ! 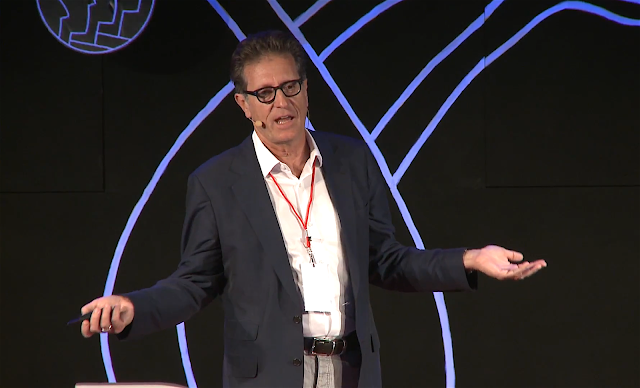 Watch Imagineer Eddie Sotto TED Talk, "The How of Wow!" 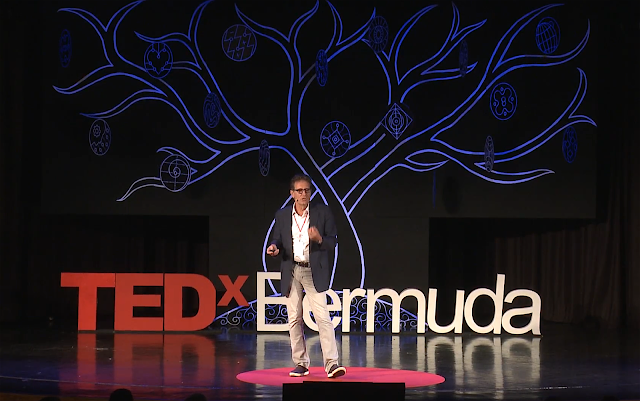 You probably all now the great TED talks, and recently the great Imagineer Eddie Sotto - who was show-producer for Disneyland Paris Main Street, TDL Winnie the Pooh, and many others great attractions - was invited to do a talk for TEDxBermuda during which Eddie explained "The How of Wow!" or how Disney parks magic is created. Don't miss this great video of Eddie, and below the video presentation text. "Designer and former Disney Imagineer shows us how capture the sense of wonder that all children have and recreate it throughout life. He takes us behind the scenes of Disneyland and shows how the carefully designed environment eases us away from the outside world and brings us fully in to the fantastical experience. Eddie Sotto was born in Hollywood, California to a family with strong Hollywood connections. His aunt, Marilyn Sotto, is a costume illustrator and designer who worked for Paramount Pictures, Universal Studios and Walt Disney Productions, and his grandfather Edward Sotto was a scenic artist at Metro-Goldwyn-Mayer and a portrait artist. His cinematic design style is largely self taught with mentors drawn from motion picture production designers and Disney's original artists. Eddie has had a multifaceted career in creative design spanning over 30 years. He was Senior Vice President of Concept Design at Disney's Imagineering division, where he helmed his own Concept Development Studio and worked on key parts of Euro Disneyland and Disneyland Tokyo, as well as several of the world famous rides at the original campuses. Exporting his skills beyond “The Mouse”, Sotto branched into creating for television, restaurant, hotel and UHNW residential interiors, even into spacecraft and private aviation, where he won a recent IYAA award for best Private Jet Concept. SottoStudios still consults to Disney on marketing strategy and Resort R&D." Tokyo Disneyland released a fantastic behind-the-scenes video showing the making of Tokyo Disneyland Beauty and the Beast attraction, one of the most awaited ride coming in 2020 at TDL! 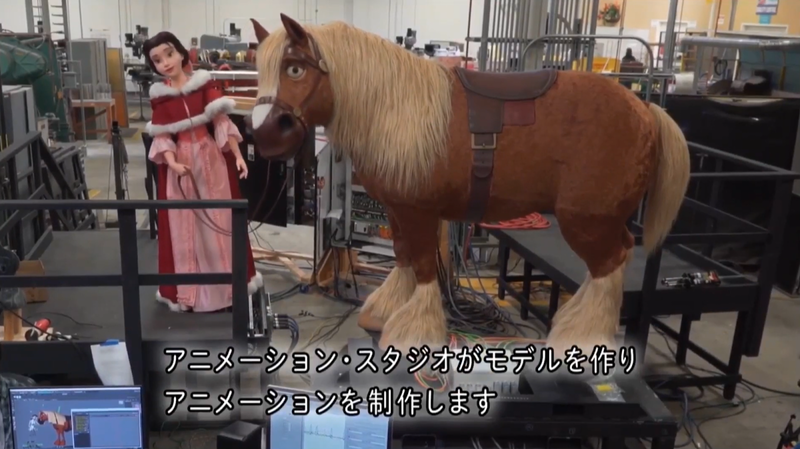 …as well as footage showing the ride vehicle in which up to 10 guests will be able to load. Go ahead, watch this exciting video, the ride opening won’t come soon enough! Holovis announced at IAAPA a new kind of flying theatre attraction concept which will revolutionize the flying theater experience as we know it. It's called Li-Fly and it uses a unique 3-DOF motion system that holds and tilts passengers into a vertical position before moving them over an ultra-high-resolution dome. “We have advanced this popular attraction format from a traditional passive lean-back experience into an active one that actually delivers true sensations of flying,” says Holovis creative director, Peter Cliff and the company is apparently already in talks with several potential clients. "The scalable attraction features surge (forward and backwards motion), one metre of heave (up and down movement) and seats that rotate through a full 360-degrees. 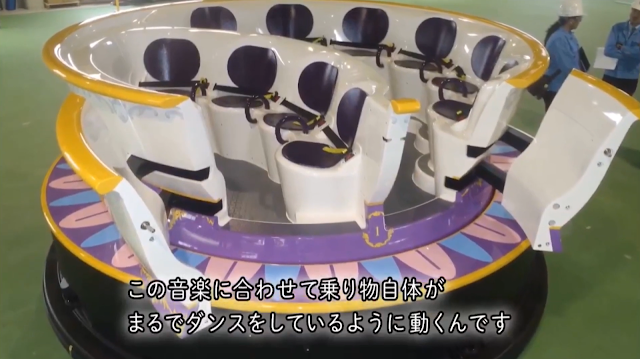 With this combination of movements – plus the lying rather than sitting riding position – guests soar through the media content as if truly flying." "Holovis has also unveiled a second model called Li-Fly Hex. This comes with 6-DOF motion including rotational and directional movement on three perpendicular axis. 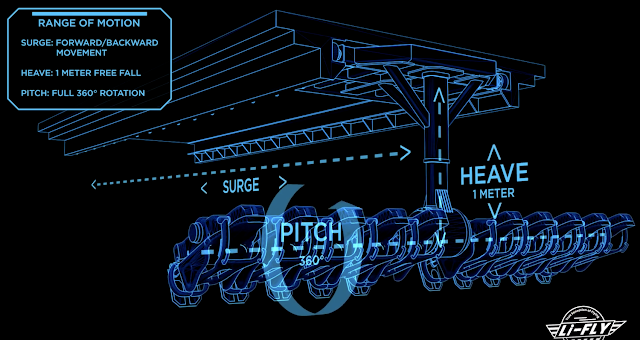 These are pitch (forward and backwards tilt), roll (side to side), yaw (left and right turn), heave (up and down) and sway (left to right)." "Both Li-Fly and Li-Flex are offered as multisensory experiences combining visuals, audio, perfectly synched motion, SFX and real-time media. These are connected to data capture mechanics that measure rider reactions to take passengers on a personalised journey. The multi-projector array in the dome is perfectly aligned, geometrically set up and colour matched using Holovis’s proprietary PixControl solution. This laser-based auto-alignment system ensures the projected images are pixel perfect every time. 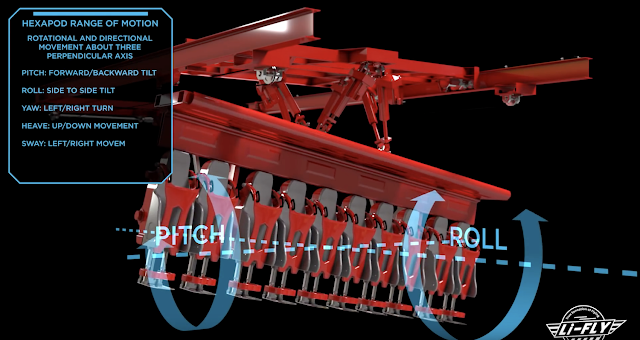 The system is simple to operate for non-technical staff. The Holovis Hifiniti immersive dome audio surrounds each guest with a 7:2 shower of directional sound and audio effects, delivering an uncompromised spatial experience. Crossfades between multiple asynchronous audio tracks are also programmed to give smooth transitions between scenes and key creative triggers in the real-time media." 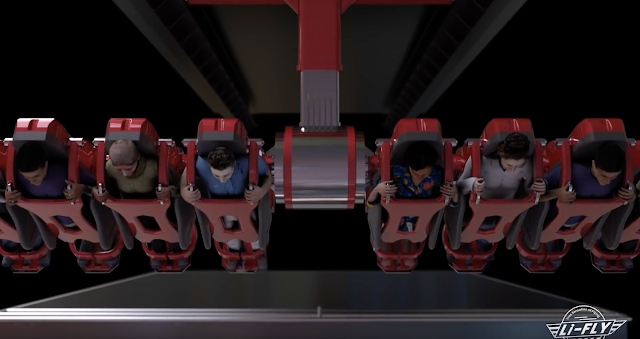 Now, there is no better way to explain what Li-Fly can do than to watch this Holovis video below, so have a look and let us know in the comments what you think and if you like to have this flying theatre system in a Disney theme park! 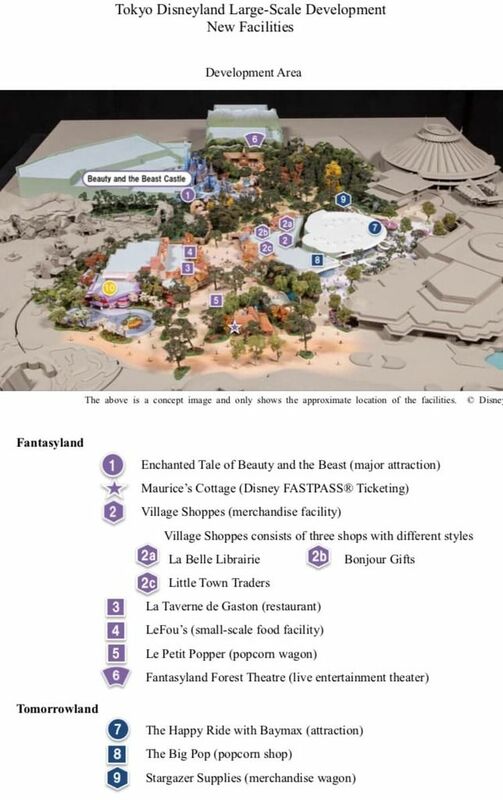 A new Forbes article reveal that Disneyland Paris has “initiated the steps to develop a park of photovoltaic panels on the top of the visitor parking to generate 33 Gigawatt hours (Gwh) per year representing around 15% of the electrical energy currently consumed". Taschen Release The Star Wars Archives 1977 - 1983 , "The definitive exploration of the original trilogy"
After the Disneyland book, the Mickey Mouse book and the gorgeous one about Stan Lee, Taschen release another fantastic book: The Star Wars Archives 1977 - 1983 , "The definitive exploration of the original trilogy". The author Paul Duncan is a film historian whose TASCHEN books include The James Bond Archives, The Charlie Chaplin Archives, The Godfather Family Album, Taxi Driver, Film Noir, and Horror Cinema, as well as publications on film directors, film genres, movie stars, and film posters. 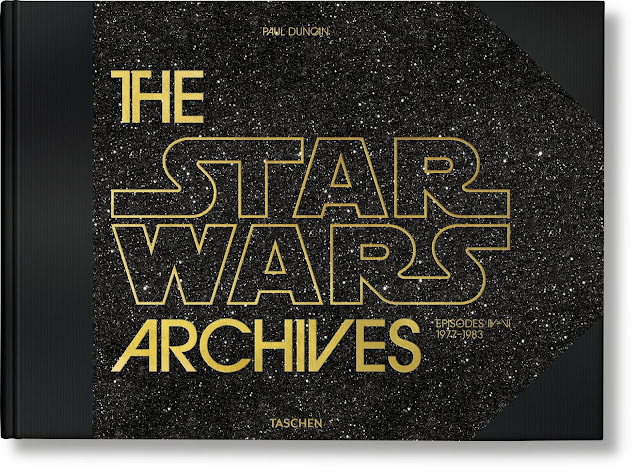 The Star Wars Archives: 1977–1983 is a Hardcover, quarter-bound , 41.1 x 30 cm, 604 pages book and cost $200. You can order it either on Taschen website HERE or on Amazon HERE. The current edition is in English. Note: The German, French, and Spanish editions will be available in 2019. 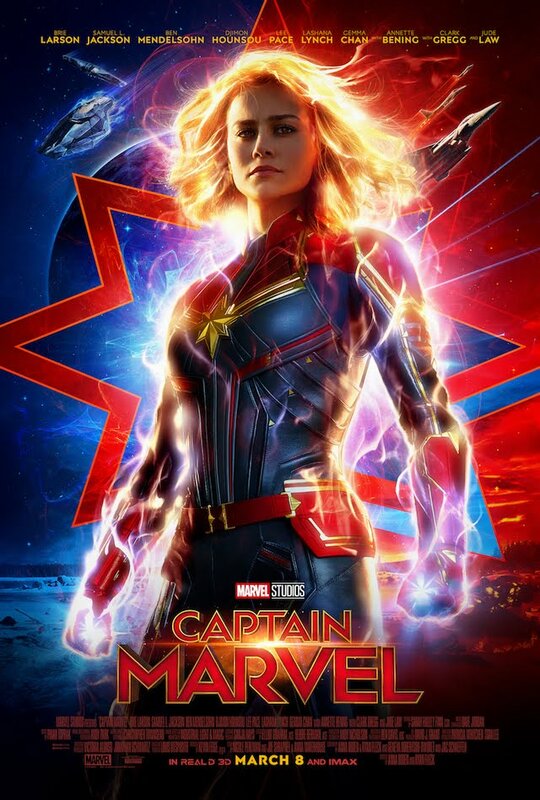 Disney released a new poster and trailer for Captain Marvel and it starts to look better than i thought... The first trailer for The Avengers 4 is also rumored to come this week! You've seen recently some great artworks that Stephan Martiniere did for Shanghaî Disneyland Treasure Cove and Adventure Isle, and today here is some fantastic never-seen-before artworks that Stephan did for Disney's Animal Kingdom Pandora Na'vi River Journey attraction! It's amazing how the colors and lighting of Stephan paintings have been wonderfully reproduced in Pandora boat ride. Make sure to click on each to see them in big size! Stephan Martiniere did plenty of others artworks in tribute to Disney animated films that you can see on Stephan website HERE. Who remember the "David Copperfield Magic Underground" restaurant project that was supposed to open at Disney-MGM Studios in the late 1990's - and finally never opened. It was announced on a big billboard near the entrance of the park, and then, not only the billboard but the whole project really disappeared! 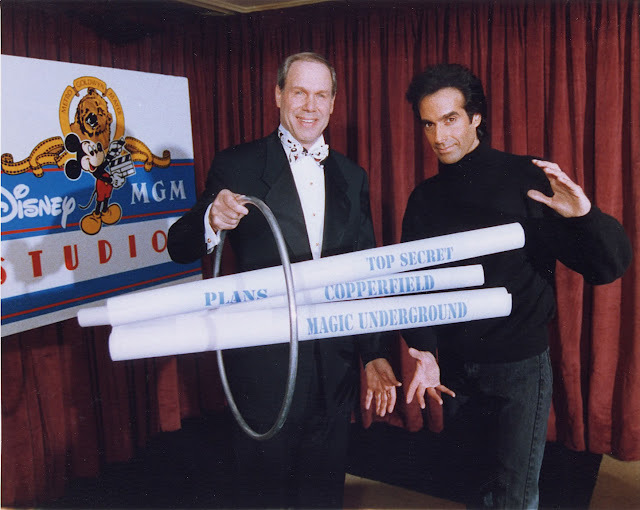 You might be interested to know what happened, so here is more about this project-that-never-was: David Copperfield's Magic Underground was planned to be a restaurant based on Copperfield's magic. There was a sign on Hollywood Boulevard during the late 90s indicating the restaurant was coming soon. Signs were also located around Pleasure Island and signs outside Disney-MGM Studios. A Magic Underground restaurant was also going to open in New York's Times Square. 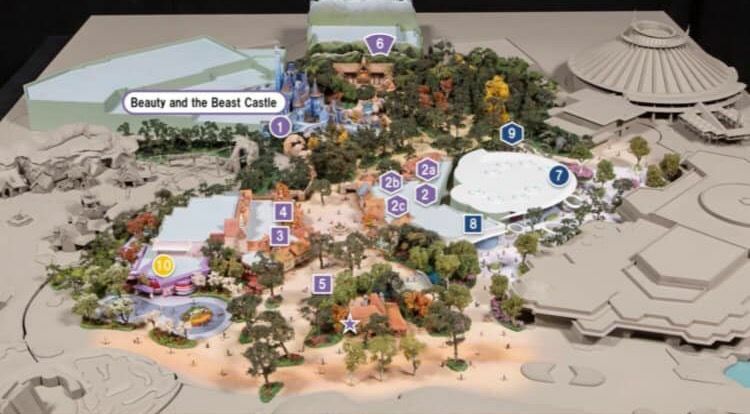 Plans also included eventual expansion into Disneyland in Anaheim, California, as well as Paris and Tokyo. The restaurants were to have magic props and other items on the walls of the restaurants while magicians would go around to tables doing sleight of hand tricks. There was also to be a larger stage for larger stunts. 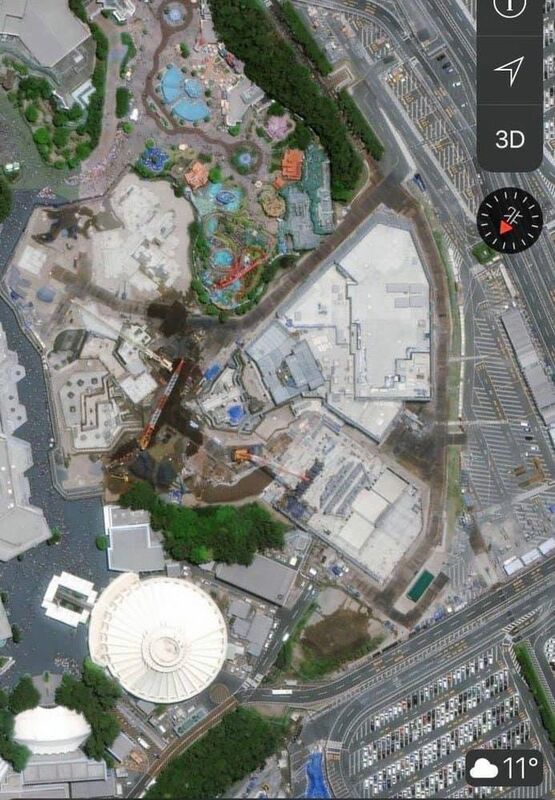 The restaurant in Times Square was 85 percent completed, but, amid disputes between the creative team and the financial team, and enormous cost overruns, finances dried up from the investors, so the project was cancelled, and Disney cancelled the lease. Copperfield was not an investor in the project; the investors reportedly lost $34 million on the project". ...Well, since then Michael Eisner also have disappeared from the WDC, but it's for other reasons! 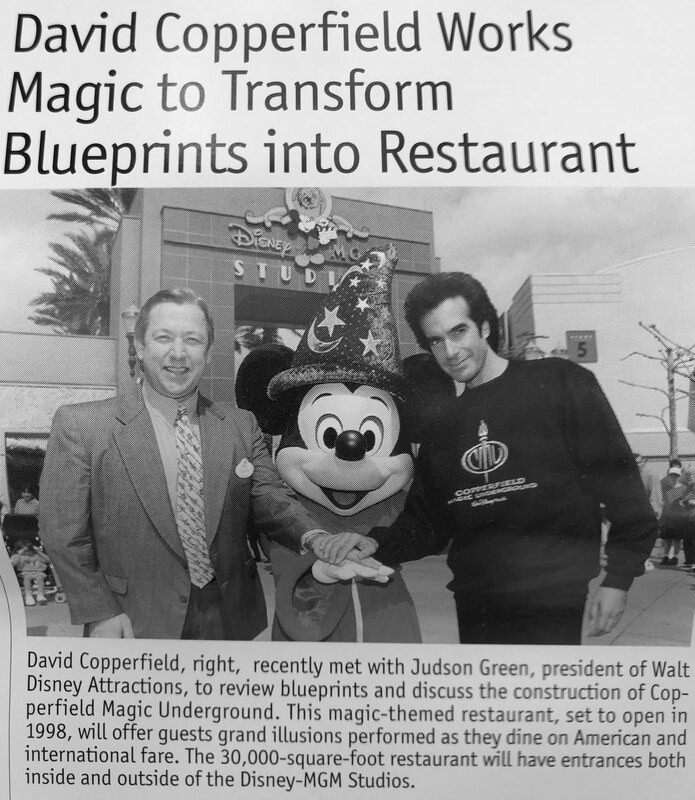 Probably the only thing that survived from this project is this great and funny picture at the top of Eisner with David released by WDW marketing office when everything was going fine with the project... until today as i've been sent this other picture above coming from a 1990's issue of "Eyes and Ears", a cast-members magazine, announcing this restaurant that never was.